I like the idea of new things, new technologies, and new possibilities. But when reality sinks in, I still tend to prefer the experience of old things. That’s not always true, of course. I’m much happier spreading store-bought butter on pre-baked bread than I am churning my own milk and kneading the dough myself. I have to draw the line somewhere. Take this pairing, for instance. I applaud Mazda’s long-overdue decision to equip the 2018 Mazda 6 Atenzawith a turbo petrol engine, but on just about any given stretch of road, I’d happily set myself up behind the wheel of the 2005 Mazda 6 MPS. 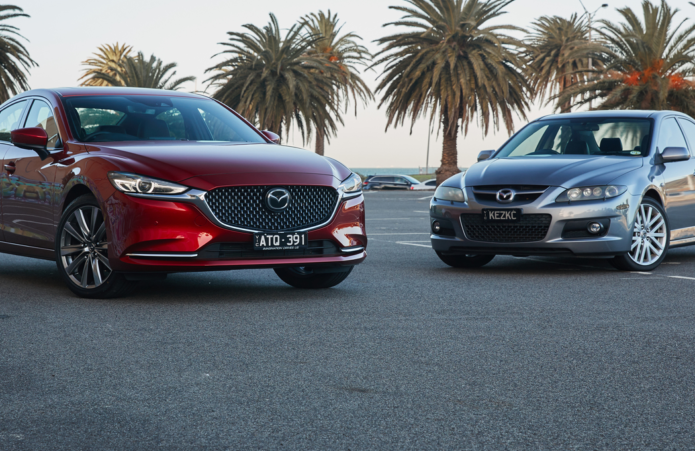 That’s not to say the third-generation Mazda 6 is in any way inferior to the first-gen model, but because as far as family lineages go, these two are about as distant as cousins can get. In this instance, the problem isn’t that the 2018 technology doesn’t live up to its potential, it well and truly does. There’s no alienating ‘disruptor’ difference to the new car either, but the 2018 Mazda 6 Atenza wasn’t engineered to the same brief as the 2005 Mazda 6 MPS, and therein lies the problem. The MPS was created as a spirited sleeper – a rapid, high grip, high-precision sports sedan that didn’t bring attention to itself – whereas the Atenza turbo focuses on being comfortable, composed and quiet, with a handy added dose of torque, and positioned as something of a luxury-brand challenger. Oh, and in the interests of full disclosure, I also really like the 2005 MPS because I own one. The one you see here, in fact. A Facebook memory from a few weeks ago reminded me that in 2013, I was searching for yet another car to park in my garage, and this time I wanted something with a bit more get up and go. I wasn’t quite able to pin down what that was exactly: a V8 Commodore or Falcon perhaps? Neither was a bad option, but both were a bit bigger than what I really wanted. And with a few Commos in my past already, plus a ho-hum selection of front-drive Japanese blandmobiles chosen for their rock-steady reliability rather than entertainment value, it was time for something different. I’d never owned an all-wheel-drive car before, nor a turbocharged one (well, a ‘real’ turbo car – I refuse to acknowledge my short-lived Smart ForTwo fascination), which settled it – I’d find myself a Subaru WRX. Only problem was, I didn’t really like any of them. Fast and noisy, sure, but all a little bit too overt and, dare I say it, common. I don’t even know how it happened, but at some point I started browsing the smaller, lighter Mazda 3 MPS, but tales of elbow-dislocating torque steer weren’t selling it to me. If only I could get the same engine paired to all-wheel drive. Well, I could. In two different cars actually: the auto-only CX-7 SUV or the manual-only 6 MPS. With approximately zero interest in owning an SUV, the choice became rather simple. Since acquiring my MPS, I’ve also been fortunate enough in my line of work to have the ability to chat with some of the guys who conceived and engineered it, which is surely any car fan’s idea of nirvana. Those conversations were casual chats. Off the record and unofficial, but usually include questions like ‘How do you find the clutch?’ and ‘How hard is it on brakes?’. I’ll answer both for you a little later, in case you’re curious. The other thing that come out of those conversations was Mazda’s strong desire to create a gentleman’s racer of sorts. Hence, the rather restrained visuals of the 6 MPS. Compared to a standard Mazda 6, you get deeper front and rear bumpers and sills, lower door cladding in place of bump strips, a teeny boot lip spoiler, 18-inch alloy wheels, and a bulging bonnet that houses covert ducting for the engine’s top-mounted intercooler. Subtle tweaks to the visual package, sure, but fast-forward to 2018 and the range-topping Atenza gets – wait for it – nothing! From the outside it looks identical to the lower-spec (but still turbocharged) GT variant, and even then the GT only stands apart from the lower-again non-turbo Touring thanks to a set of bigger 19-inch wheels. Subtle indeed. The new 6 turbo tells its story on the inside, though, with upgrades like Nappa leather trim, seat heating front and rear, front seat ventilation, part-TFT instruments, colour head-up display, and distance-keeping cruise control with a speed-limiter function that can read road signs. Some of which is Atenza-only equipment and some can be found elsewhere in the 6 range. Wind the clock back to 2005 and the MPS came in two flavours: one with manually adjusted cloth seats and no sunroof, and one with a powered driver’s seat, leather trim and sunroof. Fancy, right? Not bad for the era really, but a little skimpy next to North America, which also added things like keyless entry and start, auto up/down on all windows, and heated seats – all of which (and more) now come as standard on the Atenza. Mazda also went on a bit of an engineering splurge when it came to upgrades for the MPS, including additional front and rear cross bracing (which deletes the folding rear seats), an MPS-specific six-speed manual transmission, and unlike any other Mazda 6 available in Australia, the addition of all-wheel drive. All up, the changes equate to an extra 313kg of kerb mass compared to a regular Mazda 6 Luxury Sports of the day, which could also be ordered with a manual transmission. Good luck finding that option in the present day. Spec for spec, the MPS and its 190kW/380Nm 2.3-litre direct-injected four-cylinder engine pushed out 68kW and 173Nm more than its naturally aspirated equivalent. Today, the Mazda 6 turbo with 170kW and 420Nm (on regular unleaded and up to 184kW on premium) pushes out between 30–44kW and 168Nm more than its atmo’ range-mates. History repeats somewhat with the turbo engines in both examples being based on Mazda’s regular engine of the day. However, Mazda’s new SkyActiv engine range, developed entirely in-house, owes nothing to the earlier engine that still has ties (believe it or not) to the current Ford Focus RS and MustangEcoBoost engine stemming from Ford’s share in Mazda at the time. I feel like I could go on. Actually, I know I could, but driving is more important – and it tells the story of why I’d take the old car over the new, even if (spoiler alert) the MPS is incredibly flawed as a performance car. You see, even with a turbocharged engine under the bonnet, the 2018 Mazda 6 isn’t a performance car, nor was it ever intended to be. The 2.5-litre SkyActiv T engine was always intended for use under the bonnet of the CX-9 SUV, and then as a big lazy torque monster aimed at American tastes who might have otherwise expected a big V6. Of course, in the smaller, lighter 6 the turbo engine can deliver a little more poke, but peak power at 5000rpm and torque on tap from 2000rpm result in freight-train-style waves of shove rather than shoved-back-in-your-seat acceleration. Surprisingly, the 2.3-litre MPS isn’t too different with peak power at 5500rpm and max torque at 3000rpm, however the older engine will keep on revving to 7000rpm and belts up the rev range like a rat up a drainpipe. There’s also a noticeable calm at low RPM that gives way to some good old-fashioned turbo woosh once you crest 3000rpm on the tacho. Lovely. Oddly, though, the MPS has a fairly anonymous sound signature. At light throttle you can detect a little turbo spooling, but there’s little in the way of either induction or exhaust noise from inside the car, and only a hint of bark from the peashooter exhaust pipes nestled in their fake chrome finishes for spectators. Pin the throttle in the Atenza and the grumbly induction noise is actually rather lovely, and quite a bit deeper than that of the MPS, but again the rear pipes (real ones this time) don’t really contribute much to the aural appeal. Mazda’s continual refinement of its ride and handling package has seen the current 6 often lauded for its sporty handling feel, and Mazda has even gone so far as to develop G-Vectoring Control. This is a bafflingly complex system that nicks torque back mid-corner to put more weight over the front axle for keener cornering, while reducing straight-line effort, minimising driver fatigue, removing the potential for motion sickness, and bringing global world peace. Okay, maybe not that last one, but the others are real claims made by Mazda, and there seems to be a thread of truth to them. The Atenza does steer with a lovely fluid eagerness, and is neither too heavy nor too light, and still paints an accurate picture for the driver of what the front wheels are up to without becoming nervous. The ride’s also on the nicely balanced side, with a good level of grip and well-controlled handling without any hint of crashiness despite big 19-inch wheels. There’s no soggy, floaty wallowing either – something that seems to have worked its way out of the midsize sedan class in general over time. It’s unlikely to be an issue for an overwhelming majority of buyers in the segment, but your only transmission option is a six-speed automatic in the 2018 Mazda 6 range. One that works well, doesn’t zap too much power, and shifts in a lively manner, but not a performance transmission of any kind. The idea of squeezing 420Nm through the front treads might ring alarm bells for anyone with bad memories of the Mazda 3 MPS, however in this instance lane-swapping torque steer has been dialled down to little more than an occasional front-axle murmur. Come wet days, though, there’s more scrambling from the front tyres, yet nothing unruly or unexpected. Take a seat in the best 2005 Mazda had to offer and everything feels different, more analogue and more connected. Not to say 2018’s car feels artificial, but 2005’s is unfiltered by comparison, which can be good and bad. The hydraulic power steering in the MPS has more weight, but also suffers some inconsistencies and feeling gluggy at low speeds without the fine on-limit pointability of the Atenza. Ride quality isn’t as polished either, partly due to a firmer, flatter tune with a clearer sporty feel, but also no doubt owing to the 13 years and 130,000km that have elapsed since the dampers were minted. Get onto a nice curvaceous steam of tarmac, though, and the whole package gels remarkably, with an excellent relationship between the driver, each corner of the car, and the amount of available grip. Of course, you may not particularly want to spend hours at high speed in the MPS. There’s tyre noise, like, a lot of it, and extra engine noise. Mazda’s copped that complaint for a long time, and it’s particularly real in the MPS. Jump into the Atenza, though, and it’s like taking a seat in a library by comparison. Good work, Mazda (or should that be ‘about bloody time!’?). It’s also nice to relax in soft supple leather, find your way with the assistance of satellite navigation, let the cruise control do the distance-keeping for you, and heat or cool your bum as required. Less-refined interior materials, less-detailed information panels, and rock-hard leather trim in the MPS don’t exactly tell the premium story like a modern 6 does. Finally, grip. The MPS uses an on-demand electronically controlled all-wheel-drive system that sends 100 per cent of the torque to the front wheels in normal circumstances, but can send up to 50 per cent rearward if sensors detect slip. You’re probably thinking ‘a reactive system can’t be as good as Subaru’s constant all-wheel drive’, and you’re right. Sort of. Mazda did a pretty good job of ensuring the rear wheels carry their fair share of the load, so there aren’t too many instances when the front axle is left overburdened. There are quirks to the system. Launch gently from a standstill on a wet day around a wide intersection, and the system seemingly never detects either the gentle curve or the wide-pushing front wheels. Give it some beans in a straight line in the wet or on gravel and the hook-up is near instant. Throw in fast-paced directional changes and full-throttle full-lift driving, and any sign of hesitation dissolves into ready to party rear-end playfulness. Mazda’s extra 313 kilos of reinforcement no doubt does wonders for chassis rigidity, but isn’t the best friend of handling, and the extra pork is always apparent on a spirited drive. As for the question of brakes asked by my friends at Mazda? Well, as a commuter car it’s fine, but turn up the heat at a track day – as I’ve done a couple of times – and the 6’s overworked front brakes generate masses of heat, don’t cool particularly well, and shred pads in very short order. The same goes for the tortured front tyres. Carrying most of the load and worked hard, there’s big heat in the front rubber after a set of hot laps compared to the rears, and accelerated wear shows early on the outer corners. Then again, I haven’t had the chance to belt the Atenza around a track and it could be just as bad, so the point is probably moot. It won’t suffer the MPS’s clutch niggles at least. Long held as a sticking point for some, the 6 MPS arrived on the market with a hard-to-launch clutch that took the shine off driving impressions. A heavy pedal and a high take-up point with little in the way of pedal feel creates a steep learning curve. Mazda has rolled out ‘modification kits’ to temper the problem, and familiarity for me makes it something of a non-issue. But in moments when you lose focus, the clutch will genuinely take any opportunity it can to make you look like a novice. To make up for it, the MPS has a surprise and delight ‘drift’ feature built in. Nothing like the Drift mode of a Focus RS, and often explained poorly, but fun all the same. Pulling the handbrake in the MPS immediately disconnects the rear axle and loosens stability control. But rather than doing it to unsettle the rear, the goal here is to drop the handbrake, at which point the system will deliberately overcompensate for the idle rear and send maximum torque (that’s 50 per cent, remember) to the rear axle, providing on-demand drifty, slidey, sideways fun. Mazda engineers clearly had their thinking caps on for this car, so why did it only last two years? Delving into that catalogue of off-the-record comments, it seems that Mazda spent a lot of time talking to American customers in particular and asking them what they wanted from a performance car. Problem is, what buyers said they wanted and what they actually bought were rather different. Focus groups reportedly said they wanted a car with a manual transmission, but most of them bought cars with automatics. Of those that said they wanted a subtle appearance package, many found the MPS too little changed from the regular 6. Then there was the price difference in Australia. A top of the range 6 Luxury Sports manual carried a price before on-road costs of just under $41,000, while the MPS was stickered at $54,600 without looking very different and with only minor trim and equipment changes, performance upgrades notwithstanding. Ouch. Across the road at Subaru, though, the Liberty GT, the MPS’s most direct rival, did just fine with subtle styling. Maybe because you could buy one with an automatic? Maybe because Subaru had rally heritage that Mazda didn’t? Or maybe because buyers wanting a more grown-up WRX didn’t actually go looking for it outside of Subaru showrooms? Mazda missed a few beats there obviously, and never bothered to develop an MPS wagon, which was another string in Subaru’s bow. Today, if you want a turbo Mazda 6 you’ll pay a lot less – just $47,690 for a sedan, and if you want a wagon you can finally have one from $48,990. You get an auto, which is what buyers want. You get advanced safety like autonomous braking, lane-keep assist, blind-spot monitoring, and a rear-view camera, all of which was incredibly rare in 2005. But you don’t get to spit drive to the rear axle, and even if you did there’s probably no incentive to do so with a modestly revving engine and a range of trimmings aimed at distracting buyers from ’Benz and BMWshowrooms, rather than grabbing the attention of drivers in string-backed gloves. There’s no doubt the Mazda 6 of 2018 is a better car than the Mazda 6 of 2005. It’s technologically superior, plusher and fancier inside, safer, more comfortable and quiet to boot. It appeals to the older, wiser, and more sensible logic-processing parts of my brain, which probably explains why I still prefer the MPS.